Every day it is the same. Brent is now online. Brent is now playing Devil Daggers. Every day. It’s been more than a week now. “What is Devil Daggers, and what can compel someone to play a game that I've never even heard of so consistently,” I ask myself, as I click over to the store page. Devil Daggers is created by Matt “m4ttbush” Bush, under the company Sorath. 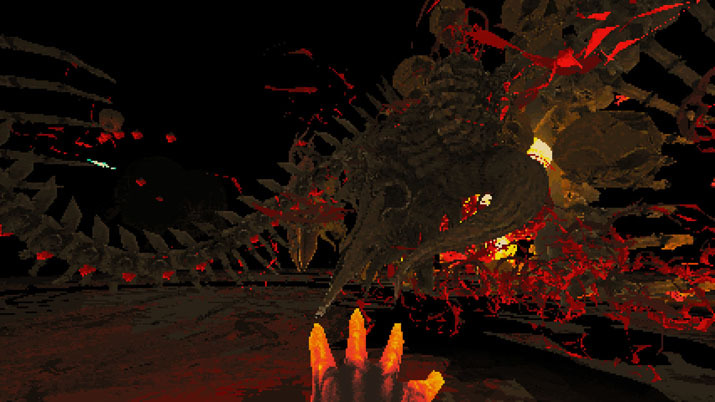 I’m greeted with screenshots that depict a hand engulfed in embers, firing countless daggers from its fingertips at hordes of lovecraftian enemies. The room is dark: there are no walls or ceilings, only a dark void. The faint illumination from the main character reveals ancient stone floors beneath. The entire color scheme seems to stick with three, maybe four colors at once — all dusty reds or luminescent yellows. They are hugging vertices that I have not seen since Quake, and they look brilliant combined. Brent offers to let me watch him play on a stream. Gameplay is frantic; daggers stream from his fingertips, slicing up enemies like pinatas to reveal gems. 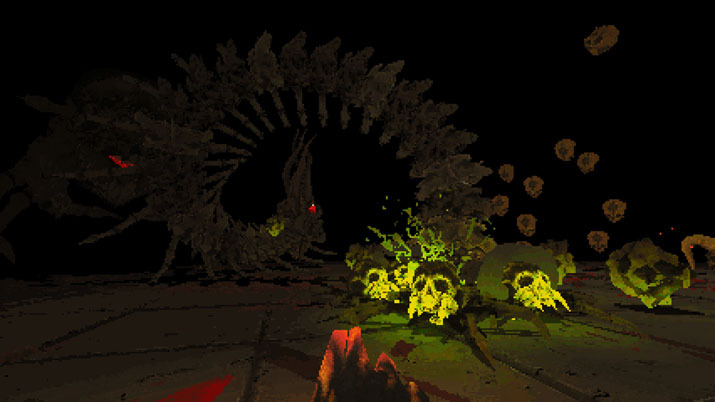 Floating skulls hunt him down as he runs in circles around enemies, gracefully evading every attack thrown at him and countering with hundreds of daggers at once. It’s fast paced, it’s fluid, and it’s criminally underrated. Holding the 67th place on the global leaderboards, Brent is one of the highest ranked players in the game. Everyone who has ever played a game of Devil Daggers is on this leaderboard. They are not ranked on a game-by-game basis, a la arcade, but by seconds survived, and their names ascends towards the top as they destroy waves of enemies, earning more precious seconds of life. This means that, as of this posting, there are only about 130,000 people who own Devil Daggers. The store page houses roughly two thousand reviews of outstanding approval — a ten out of ten game, according to the users. I look at the buy button: five dollars. The same price as a sandwich or iced latte (if you're getting the good stuff). I pay my dues and after a half-a-gigabyte download, I'm in the same room Brent was in. I try the proven method Brent had shown me: run in circles while holding down the mouse. Stone floors and inky darkness. I can barely see my flaming hand two feet in front of my face. Then, in the distance, spawns my first enemy: it looks like a floating demon goat head, right up until the point where the top splits open to belch out a swarm of skulls that immediately begin to chase me. I try the proven method Brent had shown me: run in circles while holding down the mouse. The stream of daggers flow freely from my fingertips, but they feel more like a beam — I'm moving fast, being the man behind the hand is so much more different than watching it. I adjust my aim and take out the cloud of skulls and their mother too, and before I know it, there's two more in the room with me, now three, now three and a spider — and I’m dead. But, I am interested. The game's fluid, responsive controls and variety of enemies make me hungry for another round, another chance to collect more gems, which slowly upgrade your hand and increase the amount of daggers fired per second. Death comes in one hit, which is incentive to perfect the art of maneuvering around the stage, learning how to circle strafe around enemies and avoid flying swarm chasing after you all while avoiding the bottomless chasm surrounding me. Brent was fighting Crystal millipedes that spanned the length of the entire room, and I had died by a simple spider. I'm ready to go again. I kill two heads, but die to the flock of skulls from a third. I almost took down the third skull, but fell off the map. The damn spider keeps hiding from my shots. Every round ends and with every mistake I get better, the rush of a new high score popping up in the corner outweighs the immediate death that follows in my previously uncharted terrain. The in-game leaderboard system include replays of every match and after watching runs of top players (Brent included) you start to see and learn of various techniques and see the later content that’s waiting for you and learn how to deal with new threats. Death fuels a raging fire; I shall show this game who is boss. Get some! Devil Daggers is something I didn’t expect. It’s a surprising gem hidden away from the world, but it deserves to be seen. It's endless stockpile of foes, easy to understand combat, and simple style draw me in; it’s intricately crafted and has an alluring call that entices me, like a siren in the distance. It calls, and I can’t help but answer. It’s such a unique experience, a unique blend of frantic action, fast paced shooting, it keeps you on your toes, and in addition to fending off crowds of baddies that can kill you in an instant, there's a competition that ties the environment together, a contest to become the champion of Devil Daggers. To have the highest time survived, by any means possible, add extra spice to the hot pot of intense variety already present.